On 31 March 2019, Turkey will hold municipal and metropolitan elections. 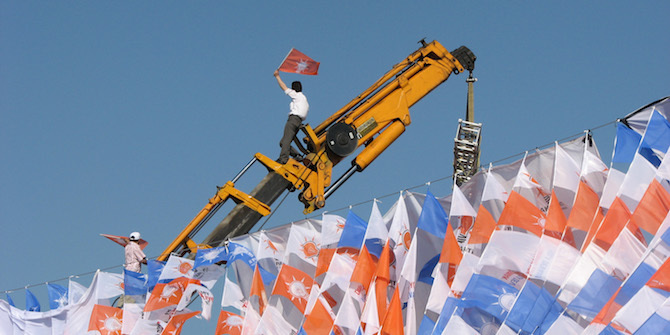 The polls, a test for the strength of the local level support for the ruling Justice and Development Party (AKP), come amidst significant macroeconomic turmoil. Over the last 12 months, inflation has climbed more than 11 percent on an annual basis, while the International Monetary Fund’s economic forecasts for the country speak of a meagre 0.4 percent growth in per-capita GDP during 2019 (compared to a world average of 3.7 percent). This macroeconomic deterioration follows a general slide in the quality of the country’s economic and political institutions. As fears persist over the strength of Turkey’s economy, what can be said about how the AKP has managed public resources since its rise to power in 2002? Do patterns of government spending reflect developmental or economic needs, or do political priorities largely dictate how budgets are allocated? New empirical analyses indicate that the AKP has systematically ‘picked’ local economic winners and losers, by strategically allocating public monies and resources to provinces for particular electoral reasons. A critical decision facing governments around the world is how to distribute public resources necessary for development, given budget constraints. A wide-ranging body of scholarship explores how self-interested politicians affect the design and implementation of public policies for strategic reasons, beyond considerations of efficiency and equity. Turkey’s public finances are highly centralised. For example, in 2005, local authorities’ share of total tax revenue amounted to 7.6 percent – that is, under one quarter of the level in Spain, half that of Mexico, and one third of the average across OECD countries. This strong centralisation of public finances offers Turkish governments a chance to manage and target public resources beyond that dictated by ‘good governance’ principles. The AKP has been no exception, with its skilful wielding of the government purse used to punish and reward voters, and the party’s de facto control over the national parliament has only heightened the centre’s control over public finances. In a recent paper, we explore the rising consolidation of power by the AKP through the lens of distributive politics, aiming to assess how the ruling party has deployed public monies towards distinct political ends. Our results indicate that the AKP has funnelled highly excludable goods to party strongholds to retain core support while directing non-excludable goods to provinces where electoral races are much closer. That is, AKP strongholds have been targeted with significantly higher amounts of government expenditure while provinces where the party’s vote share dip below the national average have received more locally non-excludable, irreversible goods, such as infrastructure investment. This preferential targeting of excludable and reversible goods, such as current expenditure or firm subsidies, to AKP strongholds is evidence of ‘portfolio diversification’, in which different budget lines are exploited for distinct strategic objectives. More specifically, reliably pro-AKP districts have been targeted with significantly higher amounts of expenditure in the areas of education – the most important line of current expenditure, which accounts for more than 35 percent of the total – defence and, to a lesser extent, cultural and religious affairs. Our results also point to higher public order and security spending in far-right strongholds, notably in the heartlands of the ultra-nationalist Nationalist Movement Party (MHP), possibly with the goal of ‘winning the hearts and minds’ of voters who are ideologically close to the AKP, and who value order and security. By contrast, even controlling for different levels of development and for a host of socioeconomic indicators, provincial strongholds of the main opposition party, the Republican People’s Party (CHP), were the biggest losers, receiving the lowest amount of spending from the central government across the majority of budget subcategories. For example, the difference between two hypothetical provinces where vote shares for the CHP are highest/lowest is almost 20 percent lower than average for current expenditure, and 120 percent lower in the case of capital investment. From a policy perspective, these findings suggest that some sectors have been less prone to discretionary spending and investment patterns along partisan lines and therefore may have functioned according to a more programmatic logic, giving rise to more equitable improvements in economic and social outcomes. Other sectors, however, have been subject to deeply partisan logics, with potentially more negative consequences for equitable and sustainable development. Recent academic evidence supports these claims. In a recent paper we show that Turkey’s incumbent government has picked local economic winners and losers depending on the levels of provincial electoral support for the incumbent party in national elections, and beyond considerations of equity and efficiency. In particular, all else being equal, battleground provinces where the AKP faced a tighter electoral race have experienced significantly faster per capita GDP and employment growth rates. This variation across provinces also appears to have substantive effects on development: Luca’s analysis suggests that a hypothetical battleground province – i.e. where the share of AKP votes is just below the national average – experienced faster per-capita GDP growth by more than 1.5 percentage points and yearly employment growth rates that are almost 5 percentage points faster when compared to districts with the lowest AKP vote share. Focusing on credit and sectoral growth, another team of researchers has uncovered how metropolitan mayoral elections influenced the distribution of credit by Turkey’s public banks and, in turn, firm performance. The authors reach similar conclusions: the incumbent government has played a substantial role in influencing local economic performance on a discretionary basis. Throughout the 2000s, Turkey was portrayed as a model of social and economic success for other countries in the Middle East and North Africa region. Yet, the incumbent government and its economic development model face increasing criticism for corrupt practices and arbitrary decision-making. Increasing evidence suggests that discretionary policy-making has affected not only individual firms and business groups through the strategic deployment of public funds, taxation and regulation, but has also shaped the distinct trajectories of provincial economies across the country, depending on their political orientations.